Research interests: sensor-based and mobile apps for healthcare, virtual environments, simulation, integration of numeric and symbolic computing, geometric modeling, problem solving environments. A Mobile Phone Application for Recording Vaccine Refusals. D. Murphy, J. Cremer, and P. Polgreen. Poster. International Meeting on Emerging Diseases and Surveillance 2013 (IMED 2013), Feb. 15-18, Vienna, Austria. A Mobile Phone Application for Pertussis Classification Based on Machine Learning. M. Adamczyk, D. Parker, O. Chipara, J. Cremer, J. Picone, A. Harati, P. Polgreen. Poster. International Meeting on Emerging Diseases and Surveillance 2013 (IMED 2013), Feb. 15-18, Vienna, Austria. Manipulating Perception Versus Action In Recalibration Tasks. C. Ziemer, M. Branson, B. Chihak, J. Kearney, J. Cremer, and J. Plumert. Provisionally accepted for Attention, Perception and Psychophysics, 2013. Perceiving and Acting on Complex Affordances: How Children and Adults Bicycle Across Two Lanes of Opposing Traffic. T. Grechkin, B. Chihak, J. Cremer, J. Kearney, and J. Plumert. Online First Publication, August 27, 2012. doi: 10.1037/a0029716. Journal of Experimental Psychology; Human Perception and Performance, 39(1), 2013, p. 23-36. Spam Detection in Online Classified Advertisements. H. Tran, T. Hornbeck, V. Ha-Thuc, J. Cremer, and P. Srinivasan. In Proceedings of the 2011 Joint WICOW/AIRWeb Workshop on Web Quality (WebQuality '11). ACM, New York, p. 35-41. Facilitating Content Creation and Content Research in Building the ``City of Lit'' Digital Library. H. Hsieh, B. Draxler, N. Dudley, J. Cremer, L. Haldeman, D. Nguyen, P. Likarish and J. Winet. Submitted to ACM/IEEE Joint Conference on Digital Libraries, 2011. Changes in children's perception-action tuning over short time scales: Bicycling across traffic-filled intersections in a virtual environment. J. Plumert, J. Kearney, J. Cremer, K. Recker, and J. Strutt. Journal of Experimental Child Psychology, 108, 2011, p322-337. An immersive virtual peer for studying social influences on child road-crossing behavior. S. Babu, T. Grechkin, B. Chihak, C. Ziemer, J. Kearney, J. Cremer, and J. Plumert. IEEE Transactions on Visualization and Computer Graphics, 17(1), 2011 p.14-25. How does presentation method and measurement protocol affect distance estimation in real and virtual environments? T. Grechkin, T. Nguyen, C. Ziemer, J. Cremer, J. Plumert, and J. Kearney. ACM Transactions on Applied Perception, of Applied Perception in Graphics and Visualization, 7(4), 2010, p.1-18. Effects of Scale Change on Distance Perception in Virtual Environments. T. Nguyen, C. Ziemer, J. Plumert, J. Cremer, and J. Kearney. To appear in Proceedings of the 6th Symposium on Applied Perception in Graphics and Visualization (APGV09), Crete, Sept. 30-Oct. 2, 2009. Estimating distance in real and virtual environments: Does order make a difference? C. Ziemer, J. Plumert, J. Cremer, and J. Kearney, K. Attention, Perception, and Psychophysics, 71, 2009. p1095-1106. 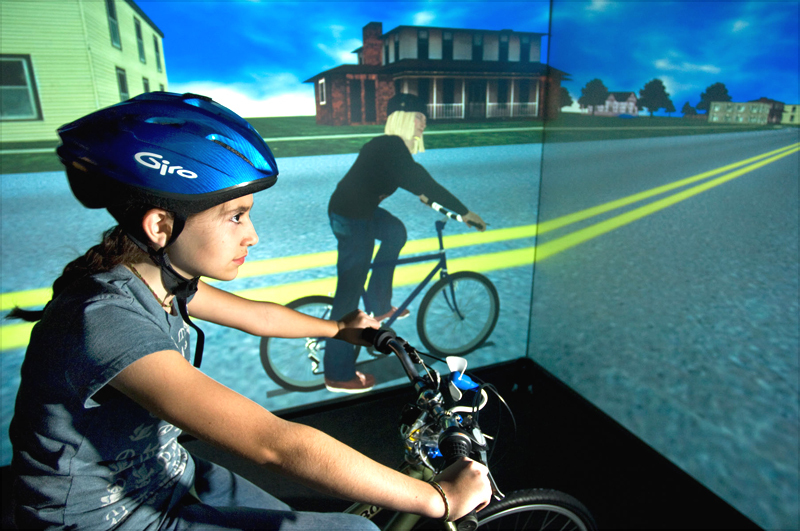 A Virtual Peer for Studying Peer Influence in Children's Bicycling. S. Babu, T. Grechkin, C. Ziemer, B. Chihak, J. Cremer, J. Kearney, and J. Plumert, to appear in Proc. IEEE VR 2009, Lafayette, LA, March 14-18, 2009. How do Bicyclists Intercept Moving Gaps in a Virtual Environment? B. Chihak, S. Babu, T. Grechkin, C. Ziemer, J. Cremer, J. Kearney, and J. Plumert. Proceedings of the 5th Symposium on Applied Perception in Graphics and Visualization (APGV08), Los Angeles, August 9-10, 2008, p.188. How Does Traffic Density Influence Cyclists' Gap Choices? J. Plumert, J. Kearney, and J. Cremer, short paper and poster at International Conference on Road Safety and Simulation (RSS2007), Rome, Italy, Nov. 7-9, 2007. How does 2-way traffic impact children's road crossing behavior in a virtual environment. C. Ziemer, J. Plumert, B. Chihak, J. Cremer, and J. Kearney. Biennial Meeting of the Cognitive Development Society, Santa Fe, New Mexico, October, 2007. Children's Road Crossing: A Window Into Perceptual-Motor Development. J. Plumert, J. Kearney, and J. Cremer, Current Directions in Psychological Science, (16)5, October, 2007, p. 255-258. Making Distance Judgments in Real and Virtual Environments: Does Order Make a Difference? C. Ziemer, J. Plumert, J. Cremer, and J. Kearney, poster in Proceedings of 2006 Symposium on Applied Perception in Graphics and Visualization (APGV06), Boston, July 28-29. Steering Behaviors for Autonomous Vehicles in Virtual Environments. H. Wang, J. Kearney, J. Cremer, and P. Willemsen, Proceedings of IEEE VR 2005, Bonn,Germany, March 12-16, 2005, p. 155-162. Distance Perception in Real and Virtual Environments. J. Plumert, J. Kearney, J. Cremer, and K. Koson, ACM Transactions on Applied Perception, 2005 (extension of APGV04 paper), 2(3), p. 286-308. Distance Perception in Real and Virtual Environments, J. Plumert, J. Kearney, and J. Cremer, Proceedings of the First Symposium on Applied Perception in Graphics and Visualization (APGV '04), Aug. 7-8, 2004, Los Angeles. "Children's Perception of Affordances: Bicycling across Traffic-Filled Intersections in an Immersive Virtual Environment," J. Plumert, J. Kearney, and J. Cremer, Child Development, 75(4), 2004. "Sound Modeling in a PC-based Virtual Bicycling and Driving Environment," S. Jezewski, J. Cremer, and J. Kearney. 2004 Image Society Conference, Phoenix, Arizona, July 12-16, 2004. "Steering Autonomous Driving Agents Through Intersections in Virtual Urban Environments," H. Wang, J. Kearney, J. Cremer, and P. Willemsen, Proceedings of International Conference on Modeling, Simulation and Visualization Methods, Las Vegas, Nevada, June 2004. "Exploring Virtual History at The National Museum of American History," J. Severson, J. Cremer, K. Lee, D. Allison, S. Gelo, J. Edwards, R. Vanderleest, S. Heston, J. Kearney, G. Thomas. Proceedings of the 8th Intl. Conf. on Virtual Systems and Multimedia (VSMM2002), Gyeong-ju, Korea. September 25-27, 2002. p. 61-70. Real-time Extendible-resolution Display of On-line Dynamic Terrain. Y. He, J. Cremer, and Y. Papelis, to appear in Proceedings of Graphics Interface 2002, May 27-29, Calgary, Alberta. Refiner: A Problem Solving Environment for Scientific Simulator Creation. K. Hunt and J. Cremer. to appeaer in Transactions of the Society for Computer Simulation. "This Old Digital City" One Year Later: Experience Gained, Lessons Learned, and Future Plans. J. Cremer, J. Severson, S. Gelo, J. Kearney, M. McDermott. Proceedings of the 7th Intl. Conf. on Virtual Systems and Multimedia (VSMM2001), Berkeley, California, October 25-27, 2001. p. 49-56. This Old Digital City": Virtual Historical Cedar Rapids, Iowa circa 1900 J. Cremer, J. Severson, J. Kearney, S. Gelo, M. McDermott, and R. Riccio. Proceedings of the 6th Intl. Conf. on Virtual Systems and Multimedia (VSMM2000), Special session on Virtual Heritage. Softopia, Ogaki, Gifu, Japan. October 2000. Pages 27-34. Dynamic Terrain for Real-time Ground Vehicle Simulation. J. Cremer, Y. He, Y. Papelis. Proceedings of The 2000 Image Conference, Scottsdale, AZ, July 2000. Interactive Manipulation of Articulated Objects with Geometry Awareness. M. Choi, J. Cremer. Proceedings of the 1999 IEEE International Conference on Robotics and Automation, Detroit, MI, May 10-15, 1999. Virtual Proving Ground Simulation for Vehicle Design. E. Haug, J. Cremer, Y. Papelis, R. Ranganathan, D. Solis. Proceedings (CD-ROM) of the 1998 ASME Design Automation Conference, Atlanta, September 13-16, 1998. Generation of Ambient Traffic for Real-time Driving Simulation. E. Bonakdarian, J. Cremer, J. Kearney, and P. Willemsen, Proceedings of 1998 Image Conference, Scottsdale, AZ, August 2-7, 1998. Embedding Scenarios in Ambient Traffic. O. Alloyer, E. Bonakdarian, J. Cremer, J. Kearney, and P. Willemsen, Proceedings of DSC 97 (Driving Simulation Conference), p. 75--84, Lyon, France, September, 1997. Directable Behavior Models for Virtual Driving Scenarios. J. Cremer, J.K. Kearney, and P. Willemsen, Transactions of the Society for Computer Simulation, special issue on Multiagent Systems, 14(2), 1997. Creating Scientific Software. J. Cremer, R. Palmer, and R. Zippel, Transactions of the Society for Computer Simulation, 14(1), p. 17--49, 1997. Driving Simulation: Challenges for VR Technology J. Cremer, J. Kearney, Y. Papelis VR Blackboard column (ed. L. Rosenblum) in IEEE Computer Graphics and Applications, p. 16-20, September 1996. VRLOCO: Real-time Human Locomotion from Positional Input Streams H. Ko and J. Cremer PRESENCE: Teleoperations and Virtual Environments, 5(4), p. 1-15, 1996. On the Existence of Solutions to Complementarity Formulations of Contact Problems with Friction. M. Anitescu, J. Cremer, and F. Potra. Complementarity and Variational Problems: State-of-the-Art (Proceedings of the International Conference on Complementarity Problems, Nov. 1-4, 1995, Baltimore), SIAM, p. 12-21, 1996. HCSM: A Framework for Behavior and Scenario Control in Virtual Environments. J. Cremer, J. Kearney, and Y. Papelis. ACM Transactions of Modeling and Computer Simulation, 5(3), p. 242--267, July, 1995. Isaac: Building Simulations for Virtual Environments J. Cremer and G. Vanecek. Proceedings of the IFIP TC 5 WG 5.10 International Workshop on Virtual Environments, October, 1994, Coimbra, Portugal. Motion Control through Communicating, Hierarchical State Machines S. Hansen, J. Kearney, and J. Cremer. Proceedings of Fifth Eurographics Animation and Simulation Workshop, Oslo, Sept. 1994. The Software Architecture for Scenario Control in the Iowa Driving Simulator. J. Cremer and J. Kearney and Y. Papelis and R. Romano. Proc. 4th Computer Generated Forces and Behavioral Representation Conference, Orlando, FL, May 4-6, 1994. Scenario Control for Real-time Driving Simulation M. Booth and J. Cremer and J. Kearney. Proceedings of Fourth Eurographics Animation and Simulation Workshop, Barcelona, Sept. 1993, 103-120. Experiment Authoring for Virtual Driving Environments. M. Bartelme and M. Booth and J. Cremer and D. Evans and J. Kearney and R. Romano. Proceedings of the First Eurographics Workshop on Virtual Environments, , Barcelona, Sept. 1993, 1-15. Programming Mechanical Simulations. J. Kearney and S. Hansen and J. Cremer in The Journal of Visualization and Computer Animation, Volume 4, Number 2, April-June 1993, pages 113--129. Simlab: Automatically creating physical systems simulators R. Palmer and J.Cremer. In Automated Modeling, the proceedings of the Automated Modeling Workshop of the 1992 ASME Winter Annual Meeting, November 1992. An architecture of general-purpose physical system simulation --- integrating geometry, dynamics and control. Ph.D. Thesis, TR 89-987, Department of Computer Science, Cornell Univeristy, April 1989. The architecture of Newton, a general-purpose dynamics simulator. J. Cremer and A. J. Stewart IEEE International Conference on Robotics and Automation, 1806-1811, 1989. HANK, our immersive virtual bicycling and driving simulator for use in studying human behavior and VE validation. 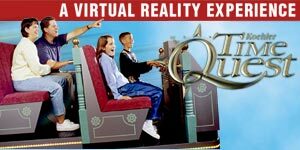 Virtual historical environments This Old Digital City. Officially called Timequest, the project created a real-time immersive virtual historical environment in which visitors to Cedar Rapids' History Center can explore the city as it was 100 years ago. An variant of the exhibit was on display at the Smithsonian's National Museum of American History in summer 2002. Iowa Driving Simulator (no longer operational, as of 1/00) scenario control and experiment authoring for real-time operator-in-the-loop virtual environments. Work in cooperation with Iowa's Center for Computer Aided Design. Programming environments for development of physical systems simulators. Originally had close ties to larger-scope SimLab project at Cornell University: SimLab project at Cornell.